Engineered Equipment Designed To Take The Heat!!! We provide specialty piping service solutions through the use of CRYOSTOP™ Freeze Seals, Mechanical Line Stops and Pipe Hot Tapping. For more than 32 years, we have offered our professional Pipe Freeze, Line Stop and Hot Tap Services to a diverse range of clients such as Hospitals, Pharmaceutical, Universities, Government Agencies, High Rise Buildings, Electrical Distribution as well as both the Non-Nuclear and Nuclear Power Generation sectors. Our past and future project successes are the direct result of superior in-house engineering, expertise in project planning, and most of all our competent and experienced field technicians. 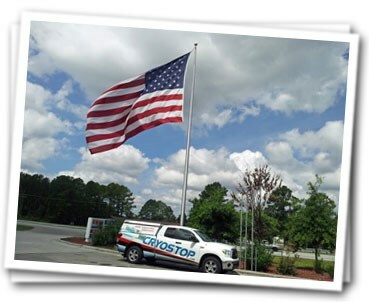 CRYOSTOP™ field technicians are continually involved in a thorough training program ensuring our customers consistently receive safe and dependable services EVERY time. CLICK HERE to view the job descriptions and apply today! CRYOSTOP is very pleased to introduce our latest CRYOSTOP service location to the greater Washington / Baltimore Metro Area. The Washington / Baltimore Metro office is located in Columbia, MD and is staffed by trained experienced Field Technicians. The local Washington / Baltimore Metro office will offer our customers innovative and proven CRYOSTOP™ Pipe Freeze Procedures, CRYOSTOP™ Mechanical Line Stops and CRYOSTOP™ Pipe Tapping. Please call our service center today at (301) 637-5182 for an on-site project evaluation visit and/or service proposal.